The Cleanup Manager allows you to strip away or rearrange various aspects of your track. The interface is self explanatory, and when you move your mouse cursor over a checkbox, Help Tips describe what each one does. No cleanup is done until the OK button is clicked. Keep in mind that not all cleanup actions can be undone, so it is advisable to save your track before applying cleanup. Cleanup Manager window, showing its default setup. There are options to remove all patterns, only the unused patterns, to merge identical patterns or rearrange them in sequential order (according to when they appear in the Order List). There are options to clear the order list, or to merge all sequences into one sequence. This helps when exporting or converting from one track format to another, especially from MPTM. Trim samples so that data after their sample loops is deleted (audio after sample loops is never reached during playback, in all circumstances). Stereo samples are analyzed and if they are found to only contain mono data, they are converted to mono samples. There are options to convert all instrument slots to sample slots (and delete all instruments), or to remove all instrument slots that are not called in any pattern. There are options to remove all plugins (clearing all of their slots), or to remove only those that are not referenced by any channel or instrument and that are not master plugins. Reset Variables converts the track to IT format and resets all settings to the IT default. This is useful for re-using samples from another song in a new track, for example when creating a sample pack for a competition (see below). Remove unused channels removes any channels that do not contain any notes, PC events or other global effects such as tempo changes. Clicking on any preset button sets the checkboxes in a default way. 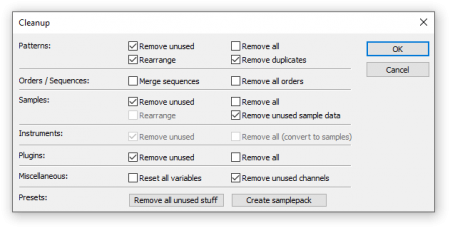 For example, clicking “Create Samplepack” will set the checkboxes for removing all patterns, orders, and instruments, while keeping all the samples (but rearranging them in sequence). With any preset you can still enable or disable any of the default checkboxes. This page was last edited on 15 August 2017, at 21:25.